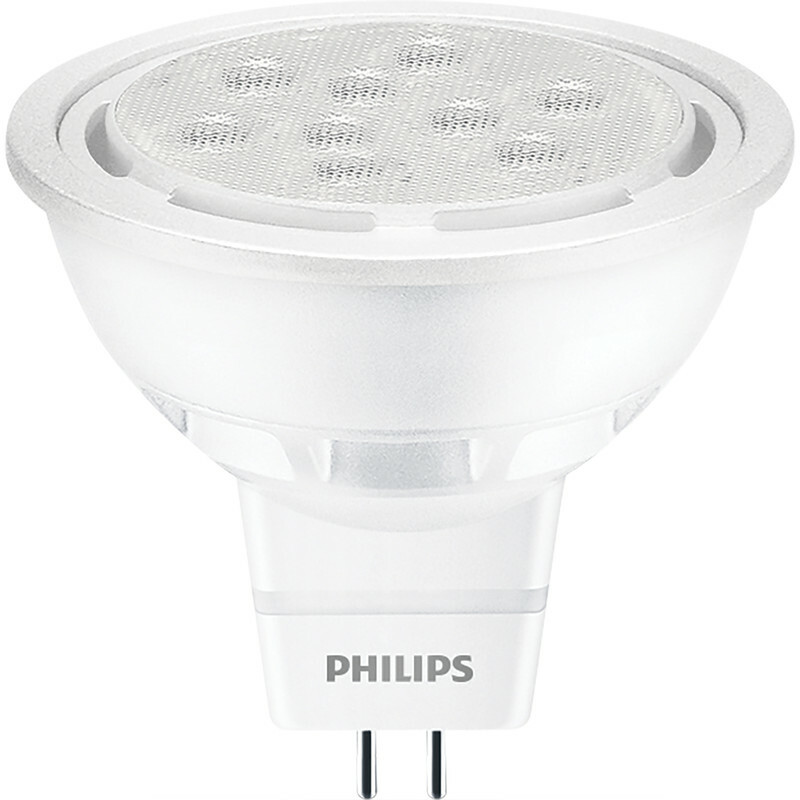 Philips LED 12V MR16 Lamp 8.2W 621lm is rated 5.0 out of 5 by 6. Rated 5 out of 5 by STEVE0855 from Much better than halogen lamp I have four MR16 lamps in downlighters in the bathroom and recently replaced one of the lamps with this LED variant. The result was a much brighter light which made the halogen types look really poor. I now intend to replace all the other halogen lamps with this LED type. It's perhaps worth noting that it's diameter is slightly smaller than the halogen type (in my case anyway! ), however the lamp was still retained via the circular spring clip in the downlighter fitting. Rated 5 out of 5 by Grandpa Charlie from These Actually Work! We have bought some LED MR16 in the past, and they don't work with all the electronic transformers in the house, and with the ones they do they were quite dim. So in trying to save money, we just wasted a load. These Bulbs are MARVELLOUS. Rated 5 out of 5 by watersorrel from Bright and a better whiter light These do not like electronic transformers but are if anything above the 2700 deg colour and a narrow beam so ideal for replacing 12v lamps in bathroom IP44+ fittings. Philips LED lamps are always reliable. Rated 5 out of 5 by Sparkey from Excellent product. Good website found exactly what I required 8watt+ MR16 led lamp. Rated 5 out of 5 by G123 from Led light Very bright light. Brighter than 50w halogen it has replaced. Will it really last 15000 hours I wonder? Rated 5 out of 5 by vandjq from Very bright! I had halogen lamp bought from the supermarket in my bathroom which claimed to be 350 lumens and were quite dim, which is why I bought these. These turned out to be far too bright so I replaced them with the 353 lumen version. I can't imagine why anyone would need such a bright light, but if you do you won't need many!